Sunny (Sandy) and Tahlia Ellie (Annie) in Annie at the Walnut Street Theatre. I knew that the amateurish mess that was the Walnut Street Theatre’s earlier-in-the-year staging of “Saturday Night Fever” was an anomaly--a temporary hiatus from the usually stellar work that has long led me to view the venerable playhouse as the gold standard of Philadelphia musical theater. My proof? The 'Nut's production of "Annie,” which runs through Jan. 7. 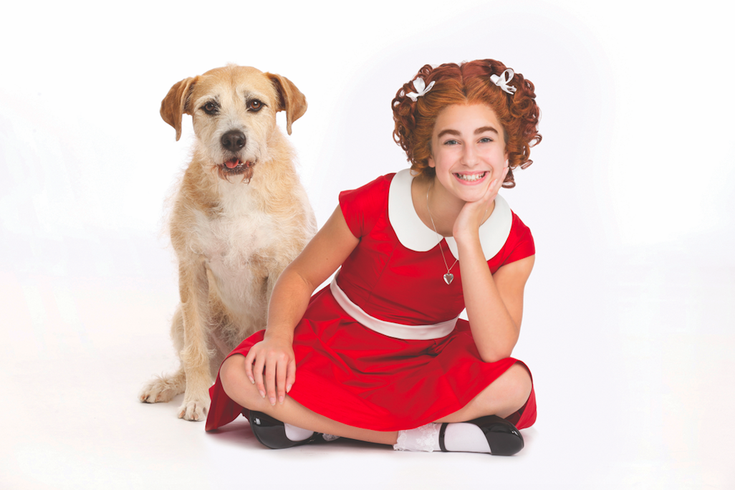 Of course, the odds were stacked in the show’s favor: As the father of two (now grown) female theater kids, I long ago discovered the many charms and pleasures of this wonderful musical inspired by Little Orphan Annie, a beloved superstar of 20th-century newspaper comic stripdom. Having sat through more public-school/community-theater versions of “Annie” than I can remember (and numerous professional and semi-pro renditions), I have long been aware of its sparkling, earworm-brimming score (by Charles Strouse and Martin Charnin) and Thomas Meehan’s droll, cogent book that somehow manages to be at once subtly cynical and wildly optimistic. And in these harsh, uncivil times, the show’s fundamental gentleness isn’t an untimely visitor. But the 40-year-old property is only as good as those who perform (on stage and behind the scenes) in its service. And this is where the Walnut gets back on track for this observer. From any angle, this is a stellar effort. Of course, it’s hard to imagine any version of “Annie” ever getting critically clobbered, because only a soulless ogre could deny the baked-in preciousness of Annie’s fellow orphans. Any iteration of “Annie,” from middle school to Broadway, is borne on the slender shoulders of whoever surveys the 11-year-old title character. Opening night, it was Tahlia Ellie, who heads up the corps of young ladies who comprise the weekday kiddies ensemble. Ellie, who is a stage natural with a big voice and endearing delivery, is a perfect fit as the plucky, but vulnerable, Depression-era foundling around whom the sleight-but-engaging plot revolves. Significantly, the young actress never tries too hard to wow the audience, something the role makes it enticing to do. To put it another way, Ellie never reaches for the moment—dramatically or musically--but instead waits for it to come to her. This is purely instinctive, and it’s a joy to watch. Of course, it’s hard to imagine any version of “Annie” ever getting critically clobbered, because only a soulless ogre could deny the baked-in preciousness of Annie’s fellow orphans. The weekday cast of six girls (Sophia Henkel, Ethen Jih-Cook, Lauren McAlee, Myra’cal H. West, Quinn Wood and Miranda Zeno) fill the stage with heaping helpings of adorable as they display veteran-like comedy timing in their big scenes. And their second-act song-and-dance turn, “You’re Never Fully Dressed Without a Smile,” is the undisputed showstopper in a program filled with audience-pleasers. Heading up the adult cast is Paul Schoeffler as Oliver Warbucks, the quintessential 20th-century capitalist whose life is ultimately changed by the red-headed moppet he welcomes into his Fifth Avenue mansion for the 1933 holiday season. As is the case with those playing Annie, actors in the Warbucks role have been known to paint the character in broad strokes as a “Buy!” “Sell!” caricature of a certain type of industrialist. But Schoeffler softens the edges of the bullet-headed capitalist titan just enough to make him a little more nuanced, hence a little more human. And he and Ellie appear to have some real chemistry. 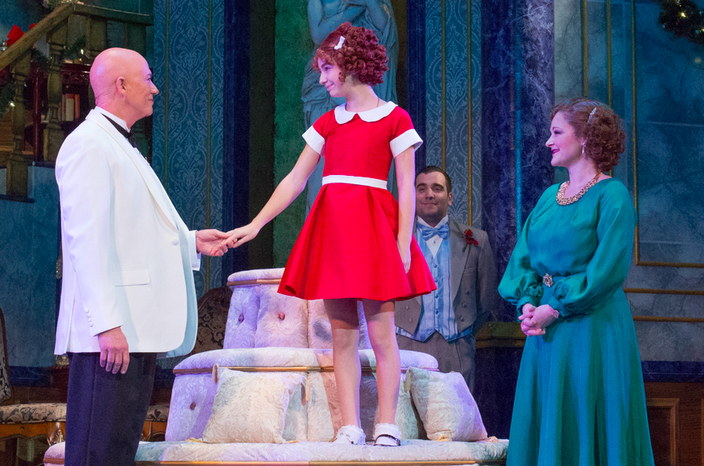 Paul Schoeffler, Tahlia Ellie, and Rebecca Robbins in Annie at Walnut Street Theatre. As Miss Hannigan, the resentful, booze-swilling supervisor of the orphanage, the ever-dependable Mary Martello delivers a master class in comic malice. Martello hams it up when necessary (e.g. her solo tour de force, “Little Girls”), but provides plenty of space for others, as in the “Easy Street” segments, which are performed as a trio by her, Christopher Sutton and Lyn Philistine. The latter two play the villains of the piece, lowlife conman Rooster (Hannigan’s brother) and his moll, a blonde floozy named Lily St. Regis (“after the hotel”). They, too, excel and add immeasurably to the fun. Backstage, scenic designer Robert Andrew Kovach’s rich sets are Broadway-caliber, while Mary Folino’s costumes capture the fashions of multiple strata of people of the period. And Ed Chapman’s sound design was noticeably superb, crisp and never shrill. Choreographer Michelle Gaudet’s blueprints are satisfyingly faithful to the “Annie” template, and Glenn Casale’s direction keeps everyone and everything flowing seamlessly from curtain to curtain. Simply put, the Walnut Theatre couldn’t have given the Delaware Valley a better—if a tad premature—holiday-season present.